Apartment moving is very different from home moving in distinguishable way. Most apartment moves require movers to use elevators or stairs at either the origination or destination. Moving up and down stairs requires specific holds, strength, and technique to properly move furniture without damage. All our movers are trained in those specific techniques. Elevator moving requires staging an elevator load at the origination level. Then completely filling the elevator to make each trip of the elevator as efficient as possible. At the destination floor the movers will then completely unload the elevator before transferring the furniture into the truck. Includes Moving Truck, Movers, Dollies, Pads, Tools, and Gas. Choosing the right Apartment Movers can be quite a challenge. There are so many Apartment Moving Companies out there that will offer you the cheap moving rates, but their actual moving service does not live up to the hype. Wildcat Movers has been in Apartment Moving business since the very beginning. We started this moving company in a college town full of apartments. Apartment moves are still a big part of our business. It can often be very challenging to move an apartment with just you and some friends. Often times there will be stairs or elevators to deal with. Well look no further, because Wildcat Movers can help. We have lots of experience as Apt Movers. We know how to efficiently move your furniture down those tricky stairwells, and tight hallways while making sure that all of your furniture and belongings make it to your destination safely. Flat Rate Long Distance Apartment Moving. Call today for a Free Quote. Check out our Movers Reviews and Contact Us today about your up coming apartment move. 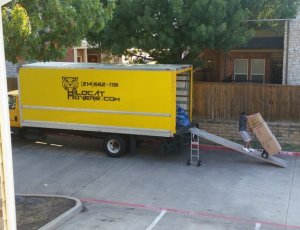 Apartment mover near me in Dallas.